Laura grew up in Florence, Alabama, and graduated from Bradshaw High School. 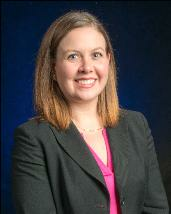 Laura then attended Auburn University and earned a Bachelor of Arts degree. Upon graduation from Auburn University in 2007, Laura attended law school at the University of Alabama School of Law, where she was awarded the Howard R. Andres, Jr. Memorial Scholarship and the William H. Mitchell, Sr. Scholarship. She also worked in the Domestic Violence Clinic, a student run legal service for impoverished victims of Domestic Violence. After graduating from the University of Alabama School of Law, Laura was admitted to the Alabama State Bar in September of 2010 and moved to Mobile, Alabama where she accepted an associate attorney position at Cunningham Bounds, LLC to work on the BP oil spill litigation. In 2013, Laura began working at Legal Services Alabama, where she helped low income clients in all areas of civil practice. Laura joined Gardberg & Kemmerly, PC as an Associate Attorney in the Social Security Disability department in January of 2016.